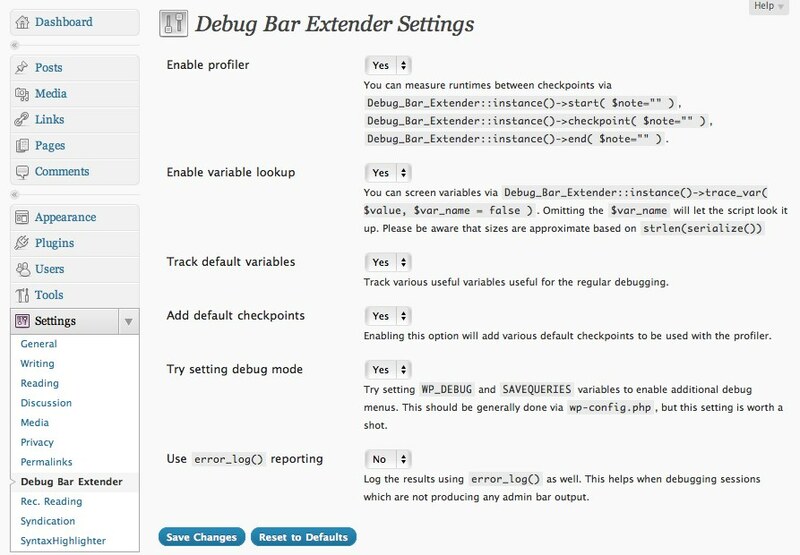 Get it in the WordPress plugin repository at http://wordpress.org/extend/plugins/debug-bar-extender or directly from the plugins section in your dashboard. I *LOVE* this plugin. Thanks so much for all your work. However, I’m having one small issue with it. Whenever the Debug Bar Extender plugin is enabled WordPress’s standard search forms don’t load. It’s not a big deal really, since I only use the plugin while on my DEV setup, but it’s something I thought I should mention. This happens on a default site setup running the TwentyTen theme (as well as my custom themes). Adding the Search widget to your sidebar or going to an empty search results page with the Debug Bar Extender activated will demonstrate the missing search form(s). The plugin appears to break the get_search_form() function call somehow as there is no HTML output for that call when the plugin is enabled. Thanks again for a sweet plugin! That’s odd, I’ll try to reproduce this and see what I can do. Thanks for the detailed comment. I just committed a fix for this. Make sure to update. Looks like the update fixed it. Thanks for fixing it so quickly! Is there any good writeup on how to effectively analyze the information available in the Profiler to identify what might be slowing your site down, or places you can improve? I’ve checked this page, the readme, etc, but I’m still at a loss for how to actually use this information in a meaningful way. Thanks!